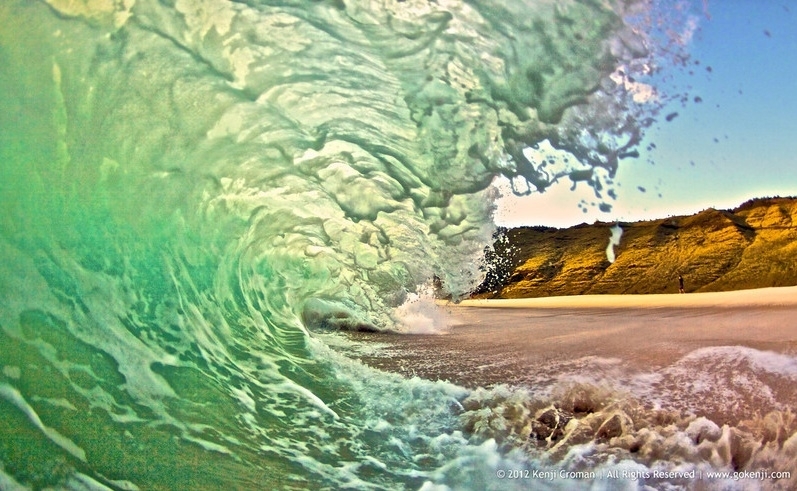 This week I've chosen to feature the work of Kenji Croman, a Hawaii-based wave and ocean photographer who's work has been seen in news outlets such as CNN, the LA Times, Digital Photographer Magazine, and many others. I really appreciate the fact that Kenji has found a genre and style that he can call his own; as it seems to be very rare these days for photographers to develop of their own style and stay within a certain genre in order to explore it as fully as possible. I was immediately struck by Kenji's drive and passion for what he does, and he was glad to share a little insight into what makes him tick. "I try to shoot daily and I'm inspired by the beauty of the ocean, I know that sounds cliche but it's true. So I try to use different techniques like using a slow shutter speed plus flash to capture movement of the ocean. I do this by juggling a lot of settings in between each wave, like the right ISO, the right exposure and I of course the right speed. I don't photoshop my images either, I think that's too easy, but like all photographers I will adjust exposure and contrast, white balance if necessary." Kenji also provided us with a link to his (successfully funded, I might add) Kickstarter project which features a few videos detailing his inspiration and technique. It's well worth a watch if you think his work is interesting.